This package is designed to provide support to workplace educators when they are hosting a James Cook University (JCU) student as part of the student’s practical education requirement for their degree. It is applicable across a range of disciplines where students engage in practice education. Practical education is a complex interaction involving the student, the educator, the university, the placement provider and their clients. 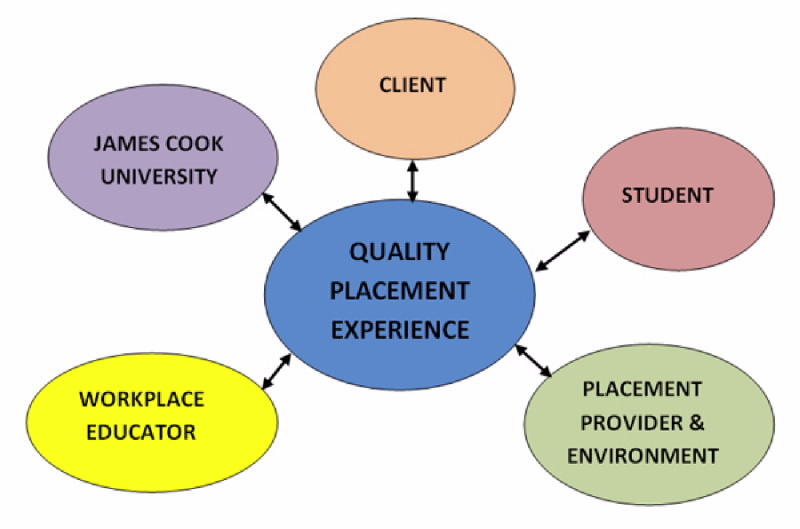 These aspects impact on every student placement and every placement is different given the diversity of settings, requirements and people involved. Preparation for having a student involves administrative, educational and management functions which are outlined below. Students undertake education in the workplace at various stages of their university curriculum. Depending on the discipline, placements will vary in how they are set up, their duration and the requirements regarding evaluation of student performance. Your JCU discipline specific contact will provide you with the details of the requirements for your student and will assist with the set up and support for the practical placement as required. The details of the placement and the requirements of JCU will be discussed with you or your workplace prior to commencement of the placement. Requirements may include some form of an agreement to outline the responsibilities of JCU and the placement provider. If an agreement is required JCU will organise the documentation with senior management of the workplace. This could be a memorandum of understanding, a deed, schedule or a service agreement. The agreement will need to be in place prior to the placement starting. The placement provider needs to make their expectations clear in the agreement. This may take weeks or months to establish. The Code of Conduct is a public statement of the standards of conduct and integrity expected of members of James Cook University. It aims to guide staff in identifying and resolving issues of ethical conduct which may arise in the course of their duties and, in so doing, maintain public trust and confidence in the integrity and professionalism of the University... There are five fundamental ethical principles enshrined in the Public Sector Ethics Act, from which the ethical obligations contained in the University's Code of Conduct are derived. Individual disciplines will have their own Code of Conduct and/or Code of Ethics with which students must comply. If there is a breach of ethical behaviour or professional conduct, please contact the university as soon as possible. At all times confidentiality of information regarding students, clients, business operation and personal information is to be respected as per the code of conduct of for your profession, workplace and JCU. Information pertaining to individual student personal circumstance and previous academic and practical education performance is treated confidentially by JCU. Students are at liberty to discuss any of these issues at their own discretion. For further information refer to the module, Managing a Placement – Confidentiality & Ethical consideration . Consent may be required by the student, placement provider or client depending on the circumstances. Consent may be required with regards to treatment, use of personal information and intellectual property. JCU students are made aware of the need for consent in certain situations. It is the responsibility of the placement provider to ensure that students are aware of consent and documentation requirements at your workplace. Pre-requisite course subjects and national registration. Please advise JCU well in advance of the placement timeframes if your facility has specific requirements for student placements e.g. Criminal History Check, additional vaccinations. potential for enrolment in the JCU Graduate Certificate in Clinical Education or other higher degree options e.g. Graduate Honours in Allied Health (Physio, OT, Speech), Doctorate of Health Professional Education. potential adjunct position with JCU. What does the student expect from the placement and workplace educator? an educator who offers effective teaching and learning experiences and who is knowledgeable of the curriculum. What does JCU expect from the workplace educator and the placement provider? comprehensive and transparent feedback and evaluation. Each profession or discipline will also have specific expectations which will be specified when establishing a placement. What can the workplace educator expect from JCU? Some incentives e.g. professional development credits. Practical Education/Clinical Education – a period of supervision where a student spends time away from JCU performing professional activities with real clients to develop and enhance skills under the supervision of a professional in their area of study and managed by JCU. Workplace Educator – Practice Educator, Preceptor, Clinical Educator, Fieldwork Supervisor, Onsite Supervisor (Rose & Best, 2005). Placement – an approved location which usually employs fully qualified professionals relating to the student’s area of study and provides a range of services where the student can observe and practice skills with real clients under appropriate supervision. Placement Provider/ Host – the nominated workplace who has agreed to supervise students for the purpose of clinical education. What did not help you? Did the style of presentation suit you? Rose, M., & Best, D. (2005). Introduction to terminology and definitions. In M. Rose & D. Best (Eds. ), Transforming Practice through Clinical Education, Professional Supervision and Mentoring. (pp.2-7). Edinburgh: Elsevier Churchill Livingstone.